Brain Evolution is a complex weave of species similarities and differences, bound by diverse rules or principles. This book is a detailed examination of these principles, using data from a wide array of vertebrates but minimizing technical details and terminology. It is written for advanced undergraduates, graduate students, and more senior scientists who already know something about 'the brain,' but want a deeper understanding of how diverse brains evolved. 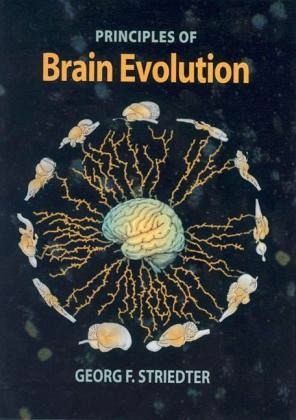 The book opens with a brief history of evolutionary neuroscience, then introduces the various groups of vertebrates and their major brain regions. The core of the text explores: what aspects of brain organization are conserved across the vertebrates; how brains and bodies changed in size as vertebrates evolved; how individual brain regions tend to increase or decrease in size; how regions can become structurally more (or less) complex; and how neuronal circuitry evolves. A central theme emerges from these chapters-that evolutionary changes in brain size tend to correlate with many other aspects of brain structure and function, including the proportional size of individual brain regions, their complexity, and their neuronal connections. To explain these correlations, the book delves into rules of brain development and asks how changes in brain structure impact function and behaviour. The final two chapters demonstrate the application of these rules, focusing on how mammal brains diverged from other brains and how Homo sapiens evolved a very large and 'special' brain. Georg Striedter is Associate Professor in the Department of Neurobiology and Behavior at the University of California, Irvine. He received his undergraduate training at Cornell University and obtained a Ph.D. from the University of California, San Diego in 1990. Most of his early research focused on the evolution of various functionally interesting pathways in fish brains. He then went on to study avian brains as a postdoctoral researcher at the California Institute of Technology. Specifically, he studied how and why parrot brains are specialized for imitating sounds. Dr. Striedter continued this work as a faculty member at UC Irvine and broadened it to include questions about how avian brains differ from those of other vertebrates in terms of structure, function and development. In 1998, he received the C. J. Herrick Award for his contributions to comparative neuroanatomy. PART 8: WHAT'S SPECIAL ABOUT MAMMAL BRAINS? PART 9: WHAT'S SPECIAL ABOUT HUMAN BRAINS? PART 10: WHAT'S SPECIAL ABOUT HUMAN BRAINS?